The commercial drive is based on improving the poor genetic material of the local sheep, improving weaning rates, balancing the flock structure, changing the mating season and introducing vaccination programmes over a five – year period. The aim is to ensure that local livestock farmers can compete favourably with commercial farmers and to receive market related income for their stock. The Eastern Cape possesses the most significant potential for livestock development. The Eastern Cape has the highest number of cattle, goats, chicken and horses in South Africa. However, emerging or communal farmers are largely unable to tap into and exploit the opportunities that exist within the commercial livestock development sector. 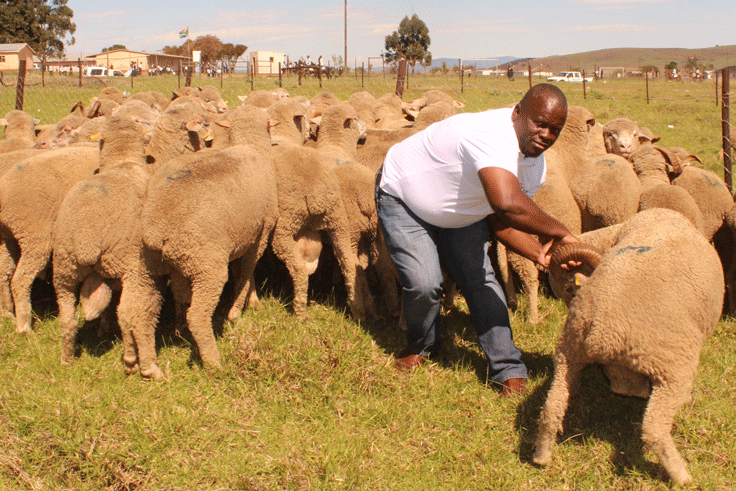 Mapuma says this commercialisation drive is crucial because the Eastern Cape is importing sheep from the Free State province because commercial farmers are losing their sheep to stock theft among other things. In Ntabankulu, there exists an opportunity to instil a commercial culture to local farmers where theft is not prevalent. This calls for deliberate state intervention to improve infrastructure and production parameters. State interventions should encourage the growth of calving rates of communal farmers from the current 30% to 60% and above. The introduction of vaccination programmes to livestock losses is crucial to cushion the vulnerable communal sector. In addition, there needs to be a concerted effort to improve the genetic material of communal livestock owned by communal farmers which the market regards as inferior. Furthermore, government interventions should be aimed at encouraging the commercialisation of this sector in order to increase rural outcomes, participation in the mainstream economy and ensuring food security.